When I just started exploring artificial lighting, I had no strobes. I had no light stands and had no nothing. Yea, when I was your age, we use to walk barefoot to school. In January. When it snowed. *cough* *cough* sorry. Something just took over me. Anyway, when I just started lighting, I looked for the cheapest light that I can afford. Halogen seemed like a good choice. It was cheap and it could be plugged in even cheap light stands. With some baking paper, it ever provided some diffused light. [Image by fangleman]. There were a few caveats though. The first and obvious one was that even 500 WATTs of Halogen are not a strong light, which forced me to work with low shutter speeds / High ISO films (yes – it was back in the film days). This is a problem that could have been easily solved with adding more lights, if it wasn’t for the second issue – those lights were hot. Not white-balance-Kelvin-rating hot (well that too) but centigrade hot. Place a few of these in a room, and you could shot an omelet by simply breaking an egg on a plate. 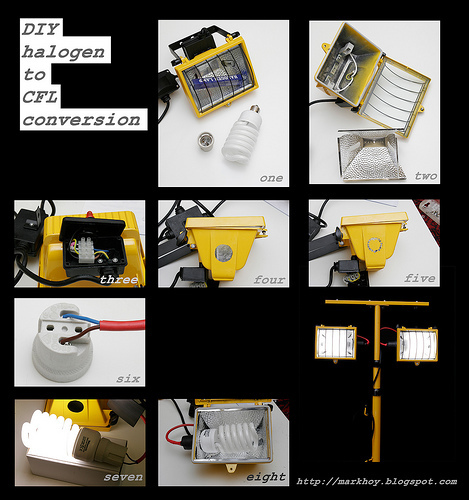 The third issue is that Halogen is a hot light. And this time I do mean Kelvin-white-balance kind of hot. Back when I was shooting film we had to use special Tungsten balanced films for this, like the Fuji T64 Slide film. This is less of an issue in today’s digital era. However, it is still no fun to balance to hard tungsten, especially if you can not shoot RAW and have to balance JPGs. The halogen casing thing has very cheap light stands. Those will work great for outdoor lighting – they are heavy and will not blow away easily. 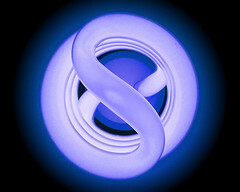 The halogen casing acts as a light modifier. Kinda similar to a regular flash reflector. This is nice if you can not afford a big gun flash. CFL is low on power. That means a few things – it is cheaper to operate; it is more environment friendly; and very important it is COLD. You do not have to turn the A/C on when using a few of those. The general math of the thing is that every 1 CFL Watt equals 4-5 tungsten Watts. Those are 3-4 watts that generate heat instead of providing precious light. Lastly if you are willing to spend a bit more you can get some great continuous lights out of those babies. A quick search found that you can get more than a 100 Watts of CFL, this is like 500 Watts of incandescent light, only daylight balanced. (There are lights of lesser intensity for less $$$. Like the 85 Watts and the 42 Watts). The image below is a short preview, head on to ukespresso’s Halogen to see the full Halogen to CFL guide, along with detailed explanations. If you are not sure how cool CFLs are, check out the Spiderlight modifier – yet another reason to go to home depot and buy a bunch of those lights. Just a quick tip. Some of the high wattage CFLs come with no ballast, and have to be placed in a special casing. Make sure you get one of the CFLs that have ballast.